We did it! 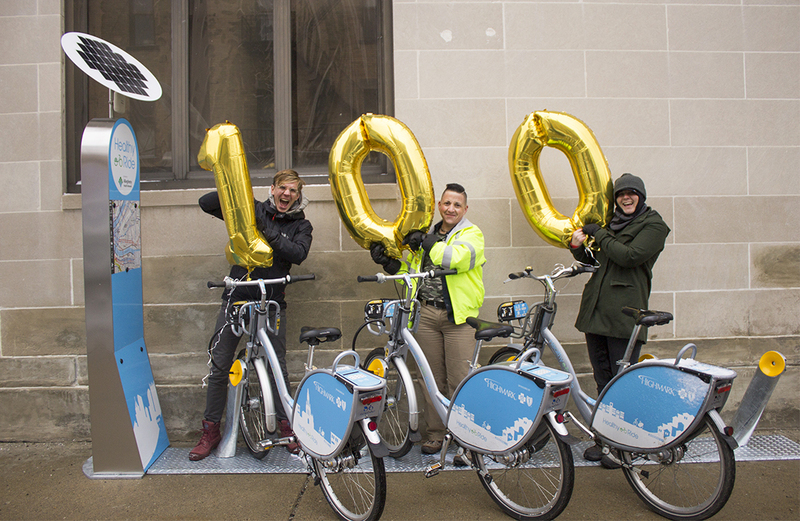 Yesterday morning we installed our 100th Healthy Ride station at Penn Ave & Winebiddle St in the heart of Garfield’s business district. We’ve been working hard since June to double our system footprint and we’re so excited to celebrate this launch with you all. We’ve filled in huge gaps in our network – like this one in Garfield along the Penn Ave corridor – as well as expanded bike share to new neighborhoods including Homewood, Larimer, and Squirrel Hill. With 50 new stations and 200 new bikes, Healthy Ride also showed ridership gains this year. By connecting new areas of the city Healthy Ride experienced a 5% growth in overall ridership, with as strong as 30% increases in our busiest months of July and August. The most popular new stations were Burns White Center at 3 Crossings, 24th St & Smallman St, Butler St & Stanton Ave, Butler St & 36th St, and Smallman St & 24th St.
As we’re sure you’ve already noticed, the new stations also look a bit different than what was installed in the original network; Healthy Ride decreased the size of the stations while making a larger, more dense network of stations. Previously, stations had on average of 19 docking points at each stations, but the new stations have only 6 docking points. Smaller stations not only reach ridership demands, but also make it easier to install stations within residential neighborhoods and substantially decrease parking impacts. And we’re not done yet! Healthy Ride will install 75 MORE stations by Spring 2019.